Does Empathy Care, Inc offer the following services? Each ZIP code that Empathy Care serves is highlighted on the map above. Empathy Care, Inc. has been a locally owned and operated premier provider for over 25 years in Palm Beach and Broward counties. Proudly, Empathy Care, Inc. was recently acknowledged as a "Torch Award for Ethics Finalist", by the Better Business Bureau serving Southeast Florida & the Caribbean (April, 2018), earned a deficiency-free inspection survey by the Agency for Health Care Administration (March 2017) and named a Top Agency of the 2016 HomeCare Elite(R), a recognition of the top-performing home health agencies in the United States. Our seasoned staff of caregivers understands how overwhelmed patients and family members can be when one's health is compromised. We will strive to make you or your loved one's experience a pleasant one while achieving the best possible outcomes. Empathy Care's skilled caregivers are direct employees of the agency who are all fingerprinted/background checked, insured, bonded and supervised. For several years I have suffered with Spinal Stenosis in addition to other lower back complications causing severe pain. The fact that I am alone here in S. Florida stopped me from a most needed surgery. After hearing about Empathy Care from a close friend, I decided to go ahead with the surgery having Empathy Care as my provider for nursing and physical therapy. I returned home with much anxiety not knowing what to expect from my recovery process. Empathy Care was with me from the first day sending a nurse with all the knowledge and caring I could have ever wished for. All my worries were gone that very first day. I was then sent a Physical Therapist three times a week for 6 weeks to practically teach me how to walk correctly since my stenosis had caused such damage. I cannot express in words the gratitude I have to this wonderful therapist who has turned my painful way of living into a day to day appreciation of enjoying my life again. My surgical sight is healed and I am moving, bending and reaching with almost no pain. My entire experience with Empathy Care was beyond 5 Stars. I recommend this agency to anyone needing any type of assistance for themselves of any family members. The name certainly fits the type of agency I was so lucky to find. Please consider the fact the agency can decline services with no notice, and your loved one has no care. There was no mistake made. It is Empathy Care, and the Administrator (who wrote reply is who I dealt with) who appeared empathic but ultimately was ruthless. When my dad was continually hospitalized, the case management at the hospital said the agency most likely declined because they were not making enough money off of him. Additionally, the administrator told me on the phone that he might be a decline in the future due to declined adjunct services other than nursing. I will never forget my parent's expression when there was no home health care to follow him after hospital discharge, and there was one nurse there that they felt connected to. What a heart! My dad can be difficult at times. He had suffered from a fall with subsequent hospitalization and rehab before a return to his 'independent' living. 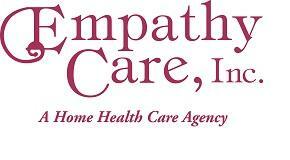 Empathy Care stepped in on very short notice and provided 24x7 aides who were extremely patient, supportive and caring. I don't typically write reviews, and I don't have enough superlatives for the support provided by Empathy Care. Empathy Care is the most caring and professional home care agency that I have worked with over my last 20 years as a healthcare professional. I personally intrusted my mother's care to them and she loved the staff and looked forward to their visits. They added a lot of quality to her last years and I highly recommend them. Empathy Care serves ZIP codes that encompass all or part of each of the cities listed below.